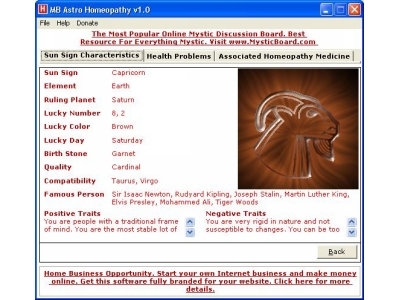 MB Astro Homeopathy Software is based on the homeopathy treatment principles as well as the astrology principles that can predict the health problems or diseases an individual may suffer from owing to the adverse influences of some of the astrological planets. This unique tool for astro-homeopathy treatment considers your birth details, does body astrology analysis and finds out the diseases you are prone to suffer from. This wonderful homeopathy software also tells you the homeopathy remedies for your health problems.